Along with a clone trooper overhaul. 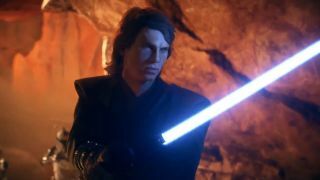 Anakin Skywalker, grumpy Jedi and soon-to-be Sith Lord, is heading to Star Wars Battlefront 2. He's arriving in the Chosen One update, and I assume he's the pre-youngling murder version of Anakin, so he'll be doing good things like killing robots and fighting Count Dooku. EA posted a brief teaser, which you can watch below. Anakin will be accompanied by a clone overhaul. The Grand Army of the Republic is getting a fresh coat of paint with a new default appearance, difference phases and more legions. Appropriately, the default appearance for the clone troopers is a nice new set of shiny armour. It's a nod to the in-universe nickname given to fresh-faced troopers, 'shinies', because they hadn't been in enough battles to scuff up their gear. The previous planet-specific default outfits will still be available, however, and you'll be able to grab them as free unlocks. The two phases of clone troopers are being separated, so they can be selected individually, regardless of the battle. The latter phase has a respirator and a few other minor changes, but both phases look pretty similar. The Coruscant Guard and 501st are joining their fellow clones, so you'll get their phase I and II outfits, as well. At least one of the 501st models shown off by DICE look different from the other phase II troopers, so maybe they've been given some extra love. They were Anakin's unit in the Clone Wars, and continued to serve him when he went all dark side, and if you can remember the name of any legion, it's probably this one. When the Chosen One update appears on February 27, everyone will get a legion crate containing a bunch of clone trooper phase I appearances, both phases for the 41st Ranger Platoon and 60,000 credits to spend on more cosmetics.